Welcome! The Yum So Fresh! site is all about clean food recipes. Our recipes are for those people who understand that food is medicine and have woken up for the food lie we have all been fed the last 20 years. Our site showcases homemade from scratch recipes that use organic food products, humanely raised meat, farm fresh eggs, emphasis on using local food producers in your area and being mindful not to include fake food, chemicals, nitrates, preservatives and all of the test tube items that sit on the grocery shelves. Our recipes are authentic recipes. We create each one and check our recipes thoroughly. If you take the time to follow them, you will love the taste of natural food which our recipes showcase. 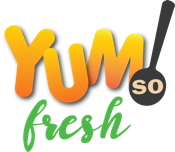 Please watch our videos and check out our Yum So Fresh! Blog. We have organic and natural information, cooking tips, techniques, catering and entertaining ideas as well as information on cooking tools, appliances and food products that we think rock! Yum So Fresh! offers free recipes and some helpful and yummy E-Books for sale that offer some of the best recipes you will find. Disclosure: Post on this site may contain affiliate links. This means, we may receive a small commission if you choose to purchase something from a link we post on the site. Don’t worry, it won’t cost you anything. This small percentage just helps us keep providing you with great recipes. We appreciate your support!